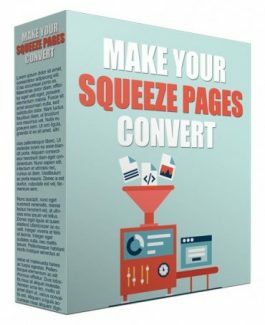 Learn the 13 Ways To Make Your Squeeze Pages Convert! If you are a blogger, internet marketer or affiliate marketer, chances are you tend to build an email list because most successful internet marketers suggesting to build a list because the money is in the list. Now, you are building your squeeze page to collect email addresses from your prospects but the problem now is that they don't optin into your squeeze page. Why is that? Inside this product are the answers to that question that will help you solve your marketing challenges.